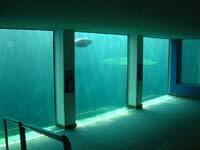 AQUALOG with its team"design and realization" can implement projects of large volumes public aquarium. The team is composed of a structural engineer, a hydraulic engineer and the museography is designed directly by Aqualog. We are able to take over the case from its inception with the establishment of record technical and economic feasibility and impact study. Through joint work with the architect and engineering firms involved, the phases of sketches, detailed design, construction, engineering and enforcement are conducted in close collaboration with the project manager. The staff also assist the work followed until the impoundment. The design and development of filtration systems and water treatment is done through AQUALOG's experience of several years in the fields of industrial aquaculture and aquariums. A team of biologists, oceanographers (certificate of competency Aquariology - Ministry of Environment) is made available during the project. The placement of large windows in methyl methacrylate is carried out by leading specialists. The museum was created in collaboration with AQUALOG's Communication teamalong with biologists who can design and implement a large range of museum presentation.